Advances in technology continue to revolutionize the healthcare industry. According to the Organ Procurement and Transplantation Network (OPTN), someone is added to the national transplant waiting list every ten minutes. That’s 144 new additions every day to a list that’s already over 100,000 names long. All of those people are hopeful that today will be the day their life will be saved. Fortunately for some, it will be, but an average of 22 people lose their life each year while waiting for a compatible organ. Quite simply, the gap between organ supply and demand is just too wide. New technology, however, could change this. Advances in the field of 3D bioprinting are making it possible to create the organs we need for transplantation. Stem cells taken from the patient’s body are sent to a lab where they can be cultivated to become the type of organ needed. A bioprinter can then undertake the painstaking process of printing the organ using these cells, after which it will be placed in an incubator to mature. Once the organ is ready, the patient receive a fully functional organ that their body won’t reject. Major strides have already been made in this relatively new field. This year, researchers developed the first functioning 3D-printed liver tissue and even printed a tiny heart on a chip. Teams have bioprinted skin, cartilage, bones, glands, “mini-brains,” and more. Seemingly every part of the human body has been the subject of a successful 3D bioprinting study. Unfortunately, the barriers to widespread adoption of 3D bioprinting are many. Growing replacement organs can be very challenging, particularly with regards to the technical intricacies involved in printing solid organs such as kidneys, hearts, and lungs. Time and money must be invested to conduct trials, study the longterm risks of compatibility, and seek approval from regulatory boards. Perhaps one of the greatest hurdles is a lack of access to digital models of target organs. These models are necessary to ensure that the final product is scientifically accurate and medically applicable. Thankfully, the 3D Print Exchange is working to change that. 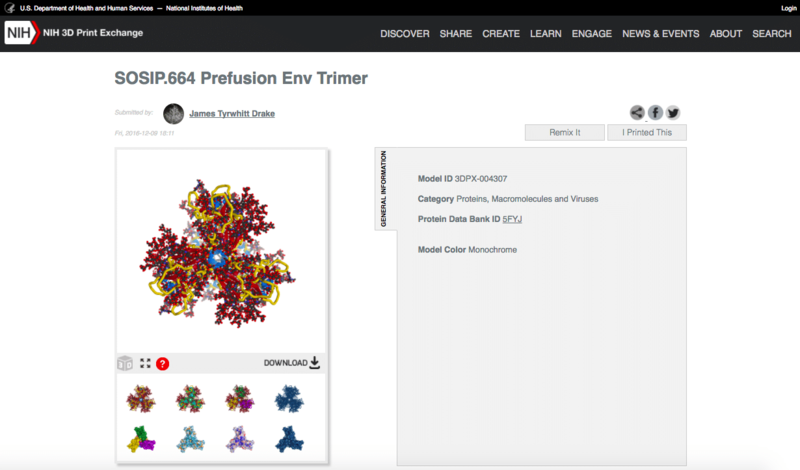 The site, spearheaded by the National Institute of Health (NIH), provides an open and interactive platform where users can browse, download, and share biomedical 3D print files, modeling tutorials, and educational materials. The hope is that making this essential information widely available will spur the adoption of 3D printing for scientific research. Overall, the benefits of 3D bioprinting far outweigh any barriers to adoption, and progress is already being made on several fronts. Cost is decreasing, which is allowing more medical institutions to explore the possibilities offered by 3D bioprinting. Combined with easy access to research through initiatives such as the 3D Print Exchange, this will make the technology even more accessible in the future, hopefully leading us to be able to say one day soon that every person who needs an organ can have one.